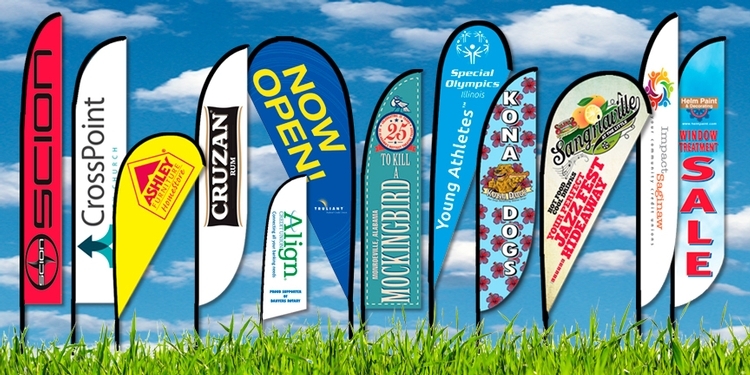 These indoor banners provide instant and easy promotional signage in-store, at trade shows or events. 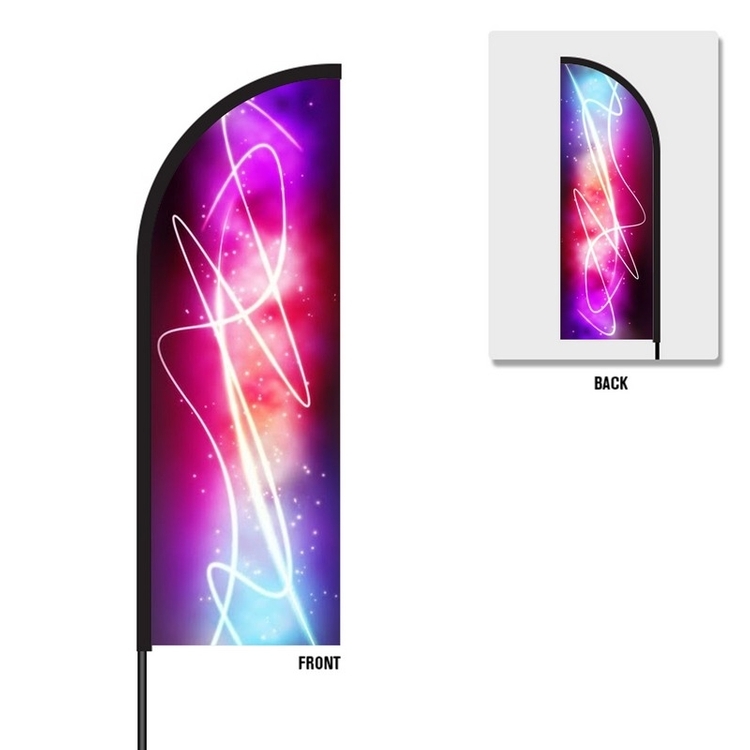 Price includes banner with same design one-side digital dye sublimated grommeted banner with tripod plastic frame, fiberglass poles, and nylon drawstring carrying bag. 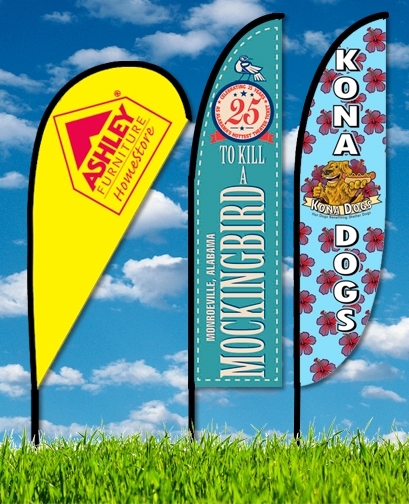 Custom digitally printed feather flag, bow flag and teardrop flags come in 3 sizes on a telescoping pole 10', 15.7' and 19.7'. 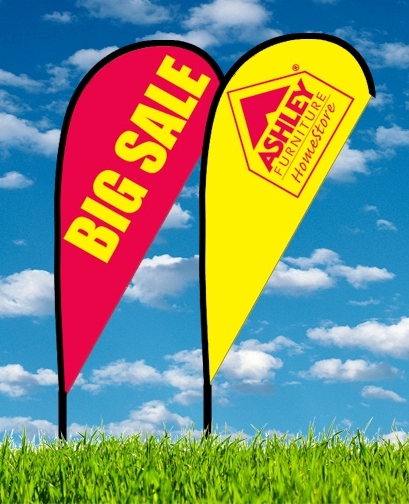 Flags can be single or double sided good for indoor or outdoor use and are dye sublimated. 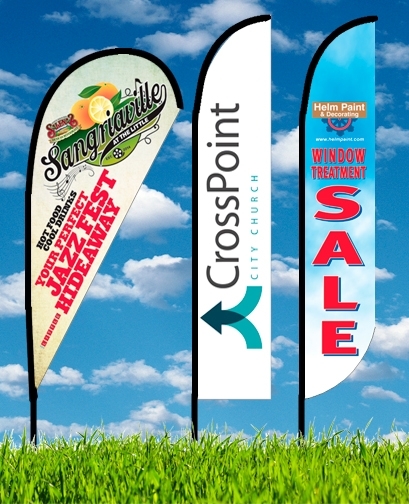 Perfect for corporate flags, promo flags, beach flags and retail flag advertising. Set up and take down is simple and all parts fit inside its deluxe travel bag. Included is the flag with a ground spike base and also a travel bag. 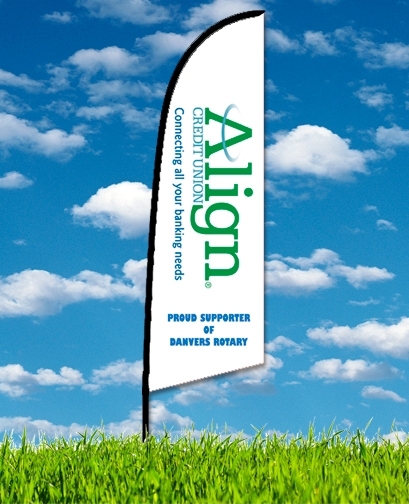 30"X60" two sided pole banners with pole pockets top and bottom. 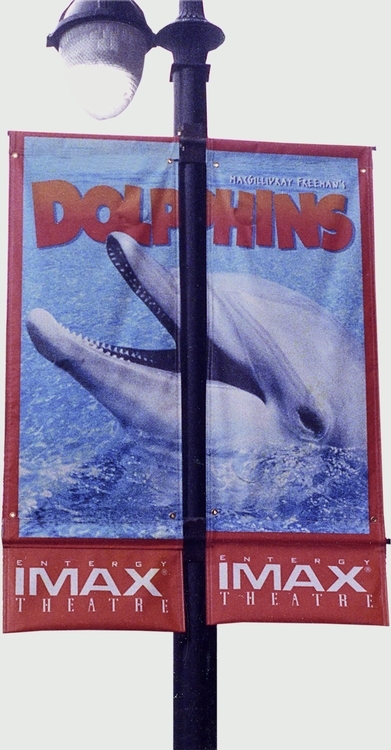 Banners are custom made from heavy duty fire retardant 13 oz "scrim" matte vinyl. They are printed full color digital with outdoor UV solvent inks that are warranted against fading for three years. Sewn hems on all four sides, 2 grommets and pole pockets top and bottom are included. They are perfect for use w/ photos and logos for school banners, event banners, outdoor banners, avenue banners, street banners, and sports banners. 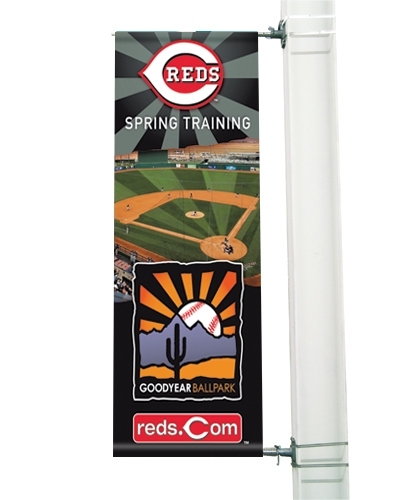 2'x6' one sided pole banners with pole pockets top and bottom. Banners are custom made from heavy duty fire retardant 13 oz "scrim" matte vinyl. They are printed full color digital with outdoor UV solvent inks that are warranted against fading for three years. Sewn hems on all four sides, 2 grommets and pole pockets top and bottom are included. They are perfect for use w/ photos and logos for school banners, event banners, outdoor banners, avenue banners, street banners, and sports banners. 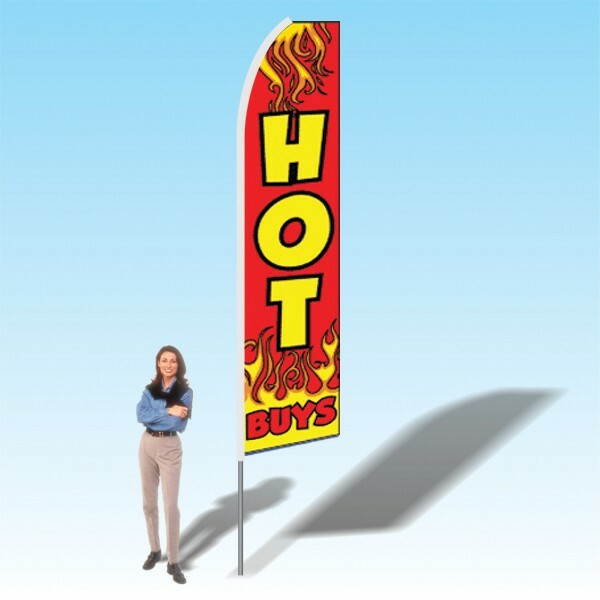 15FT Hot Buys Red Advertising Banner Flag. This feather flag features 100% dyed through printing. This means the printing is single-sided, with a reverse printing on the backside. The flags are printed onto a polyester knit-blend for durability and to ensure bright colors! This feather flag that flies in the wind has a uniquely shaped pennant. Each flag is portable and can be easily transported to multiple locations. 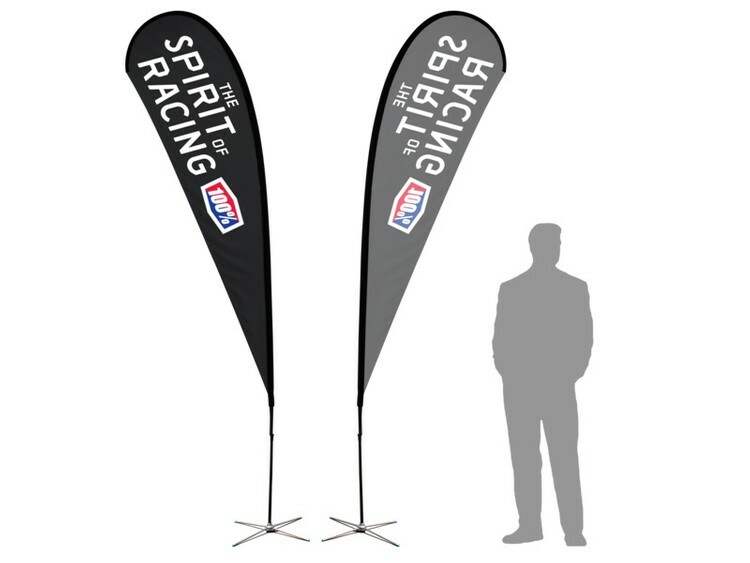 Each package comes complete with a 15’ Pole, Printed Flag and Ground Stake. DESCRIPTION Curved top teardrop flag. Full color dye sublimation imprint on UV protected, fade resistant fabric. Reinforced stitched construction with thick and durable white or black rod pocket. Mirror image on the reverse side. Double sided available. Premium pole kit with rotating steel ground stake included. FREE carry case. FREE SHIPPING. CONSTRUCTION 4 oz. Knit polyester, black or white rod pocket PRODUCTION 5 Business days IN HANDS delivery after eproof approval. FREE SHIPPING IMPRINT AREA Flag size is imprint area. Template available on website.IMPRINT METHODDye Sublimation Full color true subsurface print process onto white fabric. STOCK COLORS Custom Imprint. Add option: see GADDCW Spider base with water bag for hard surfaces. Customize your trade show experience with help from this 6' double-sided custom portable teardrop banner! Ideal for storefronts and promotional displays, this bold banner is made from knitted polyester and can be customized with a full-color imprint of your brand's logo. The amount of colors used or the complexity of your design will not affect the price, thanks to the digital printing process. The necessary hardware kit and optional cross base are sold separately. Don't forget to order the hardware kit that includes a sectional fiberglass pole with attachment hook carrying case and ground spike (Item # PTH-6T). We also offer an optional cross base for set-up on hard surfaces (Item # CROSSBASE-2 & CROSSBASE-3). 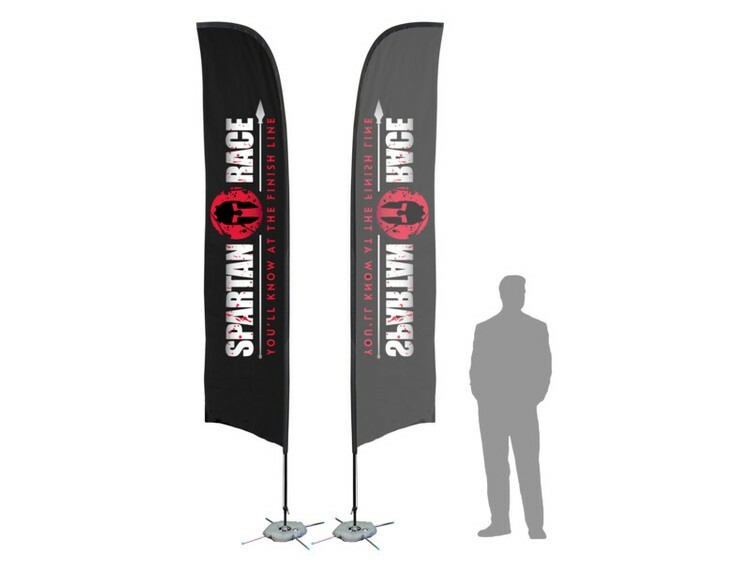 Our Flex Banner™ Flags are made from the durable and lightweight material so that it can be carried to any venue. Even this feather flags are easy to assemble and break down. Create an indoor or outdoor display to launch a product, promote an event or grand opening, or simply generate foot traffic to your location by using a product with this advertising flags. **Includes Graphic Only, Flag Pole and Platform/ Stakes are sold Separately. 15FT Look Red Advertising Banner Flag. This feather flag features 100% dyed through printing. This means the printing is single-sided, with a reverse printing on the backside. 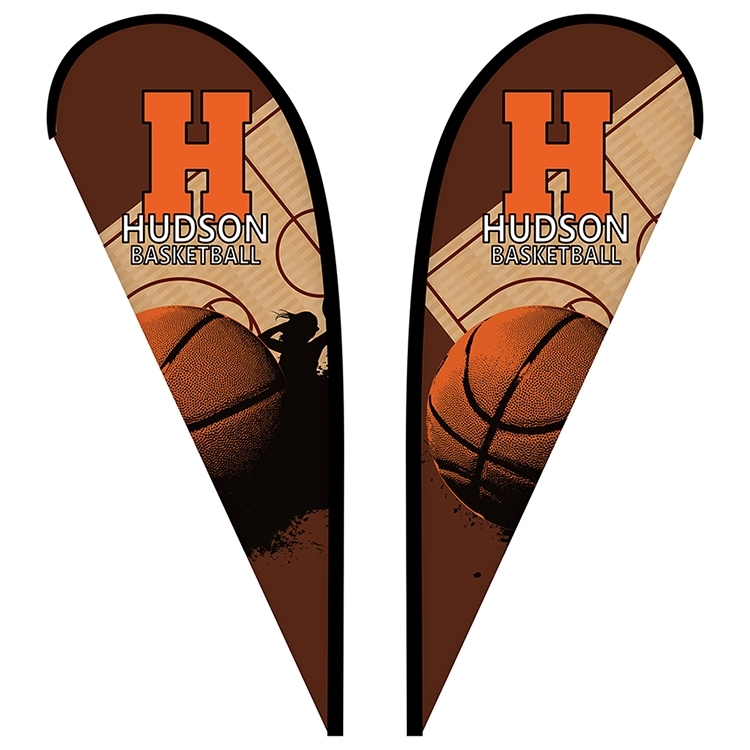 The flags are printed onto a polyester knit-blend for durability and to ensure bright colors! This feather flag that flies in the wind has a uniquely shaped pennant. Each flag is portable and can be easily transported to multiple locations. Each package comes complete with a 15’ Pole, Printed Flag and Ground Stake. 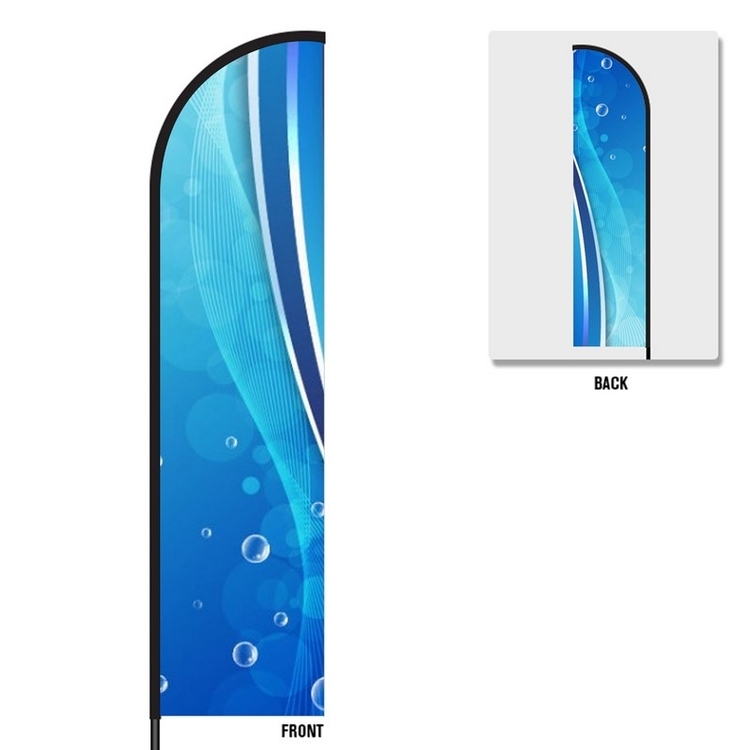 DESCRIPTION Curved top teardrop flag. Full color dye sublimation imprint on UV protected, fade resistant fabric. Reinforced stitched construction with thick and durable white or black rod pocket. Double sided imprint, single sided available. Premium pole kit with tent leg bracket included. FREE SHIPPING. Priced to be ordered with tent. CONSTRUCTION 4 oz. Knit polyester, black or white rod pocket PRODUCTION 5 Business days IN HANDS delivery after eproof approval. FREE SHIPPING IMPRINT AREA Flag size is imprint area. Inquire for Template 21" w x 40" h. IMPRINT METHOD Dye Sublimation Full color true subsurface print process onto white fabric. STOCK COLORS Custom Imprint. DESCRIPTION Curved top and flat bottom blade feather flag. Full color dye sublimation imprint on UV protected, fade resistant fabric. Reinforced stitched construction with thick and durable white or black rod pocket. Mirror image on the reverse side. Double sided available. Premium pole kit with rotating steel ground stake included. FREE carry case. FREE SHIPPING. CONSTRUCTION 4 oz. Knit polyester, black or white rod pocket PRODUCTION 5 Business days IN HANDS delivery after eproof approval. FREE SHIPPING IMPRINT AREA Flag size is imprint area. Template available on website.IMPRINT METHODDye Sublimation Full color true subsurface print process onto white fabric. STOCK COLORS Custom Imprint. Add option: see GADDCW Spider base with water bag for hard surfaces. DESCRIPTION Curved top and flat bottom double sided blade feather flag. Full color dye sublimation imprint on UV protected, fade resistant fabric. Reinforced stitched construction with thick and durable white or black rod pocket. Premium pole kit with rotating steel ground stake included. FREE carry case. FREE SHIPPING. CONSTRUCTION 4 oz. Knit polyester, black or white rod pocket PRODUCTION 5 Business days IN HANDS delivery after eproof approval. FREE SHIPPING IMPRINT AREA Flag size is imprint area. Template available on website.IMPRINT METHODDye Sublimation Full color true subsurface print process onto white fabric. STOCK COLORS Custom Imprint. Add option: see GADDCW Spider base with water bag for hard surfaces. 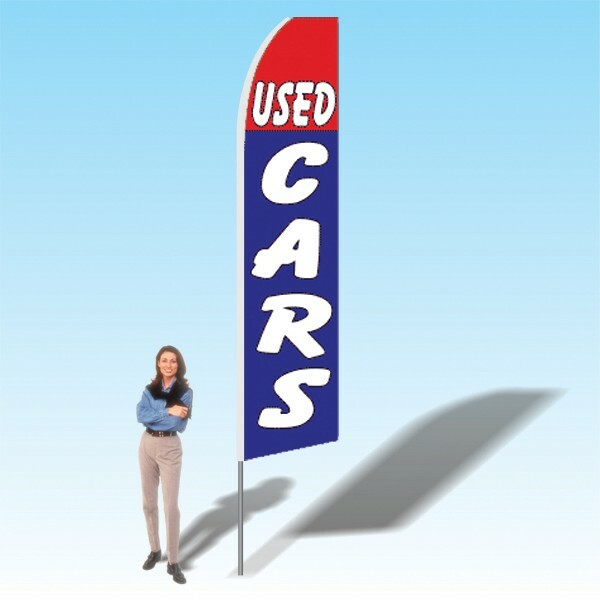 15FT Used Cars Red Blue Advertising Banner Flag. This feather flag features 100% dyed through printing. This means the printing is single-sided, with a reverse printing on the backside. The flags are printed onto a polyester knit-blend for durability and to ensure bright colors! This feather flag that flies in the wind has a uniquely shaped pennant. Each flag is portable and can be easily transported to multiple locations. Each package comes complete with a 15’ Pole, Printed Flag and Ground Stake. 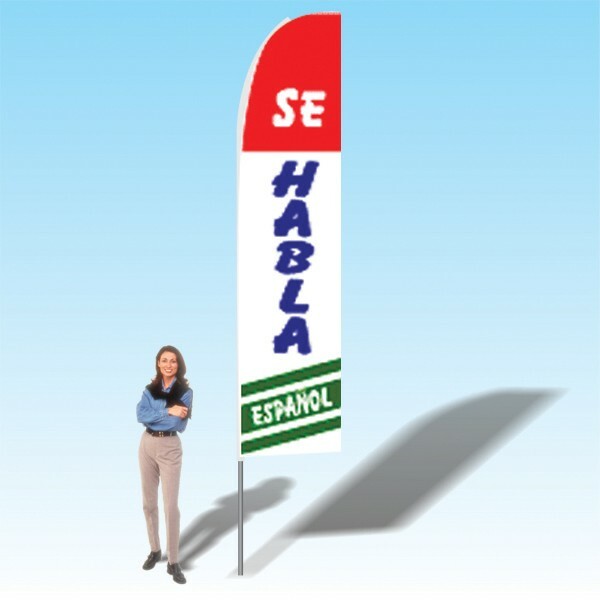 15FT We Speak Spanish Swooper Flag. This feather flag features 100% dyed through printing. This means the printing is single-sided, with a reverse printing on the backside. The flags are printed onto a polyester knit-blend for durability and to ensure bright colors! This feather flag that flies in the wind has a uniquely shaped pennant. Each flag is portable and can be easily transported to multiple locations. Each package comes complete with a 15’ Pole, Printed Flag and Ground Stake. 15FT Best Buys Here Advertising Banner Flag. This feather flag features 100% dyed through printing. This means the printing is single-sided, with a reverse printing on the backside. The flags are printed onto a polyester knit-blend for durability and to ensure bright colors! This feather flag that flies in the wind has a uniquely shaped pennant. Each flag is portable and can be easily transported to multiple locations. Each package comes complete with a 15’ Pole, Printed Flag and Ground Stake. Fly Guy Dancing Inflatable Wind Dancer. 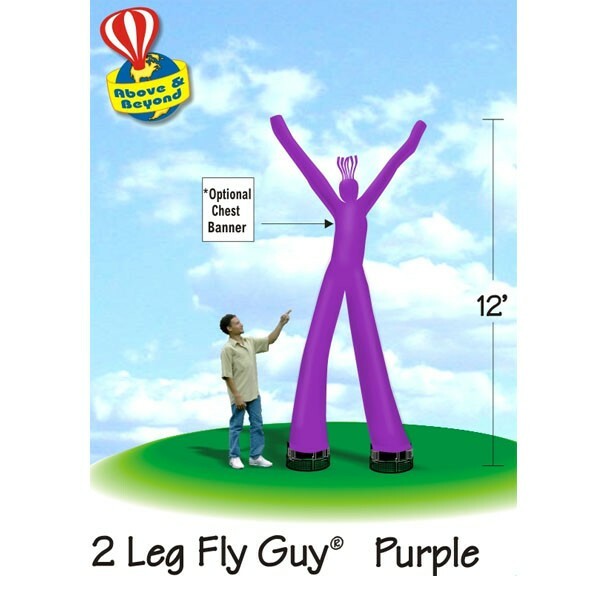 Our patented Fly Guy dancing balloons are designed for long term use. These fantastic inflatables create immediate attention at your event or promotion. Each package includes the high powered inflataion fan and Fabric. Just plug into electrical outlet to inflate. 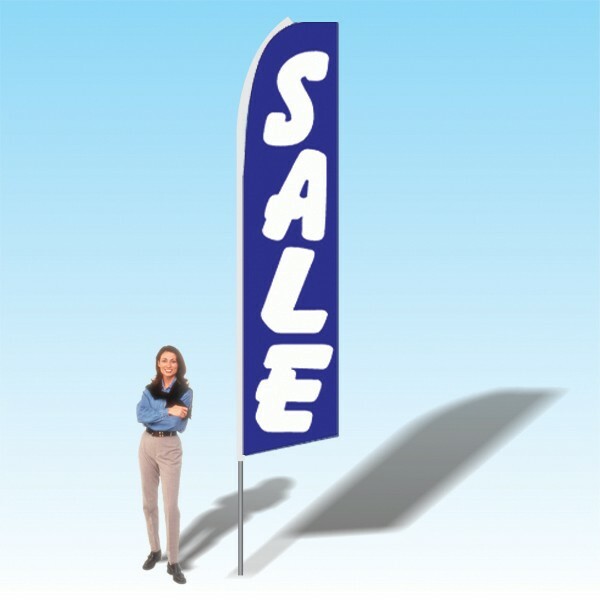 15FT Sale Blue Advertising Banner Flag. This feather flag features 100% dyed through printing. This means the printing is single-sided, with a reverse printing on the backside. The flags are printed onto a polyester knit-blend for durability and to ensure bright colors! This feather flag that flies in the wind has a uniquely shaped pennant. Each flag is portable and can be easily transported to multiple locations. Each package comes complete with a 15’ Pole, Printed Flag and Ground Stake. 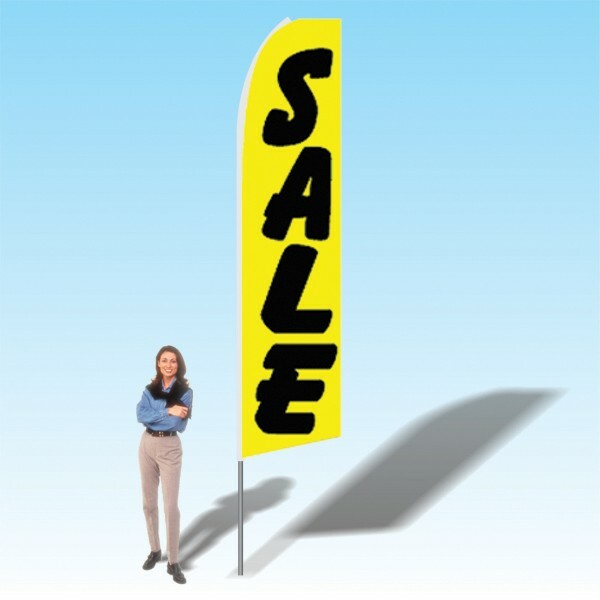 15FT Sale Yellow Advertising Banner Flag. This feather flag features 100% dyed through printing. This means the printing is single-sided, with a reverse printing on the backside. 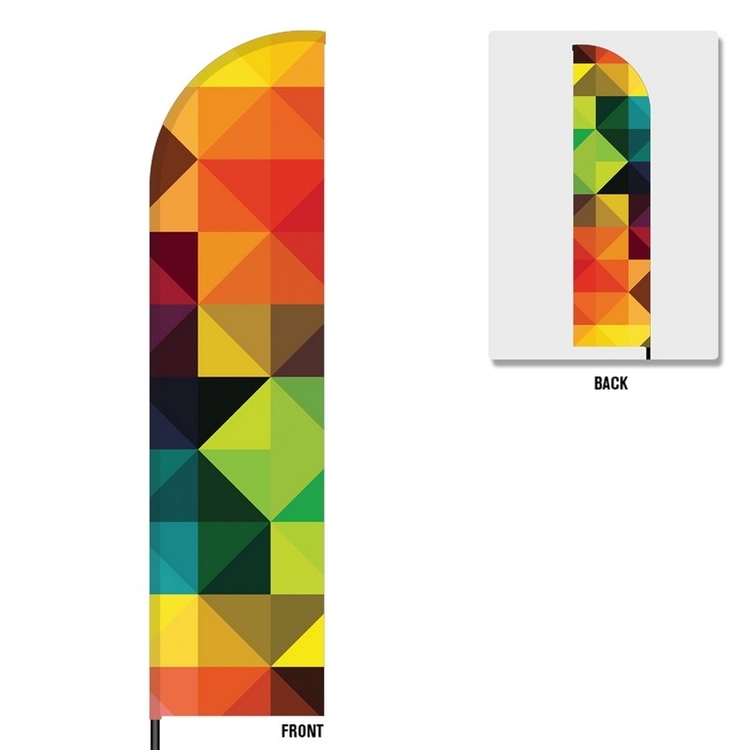 The flags are printed onto a polyester knit-blend for durability and to ensure bright colors! This feather flag that flies in the wind has a uniquely shaped pennant. 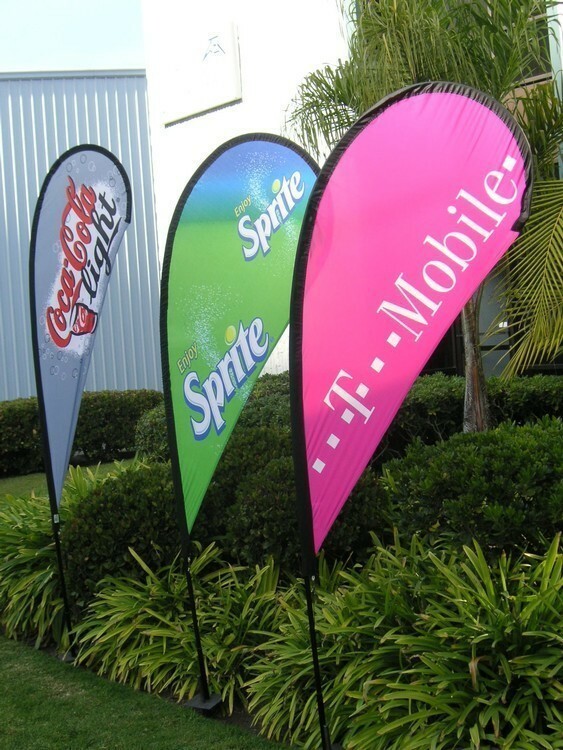 Each flag is portable and can be easily transported to multiple locations. 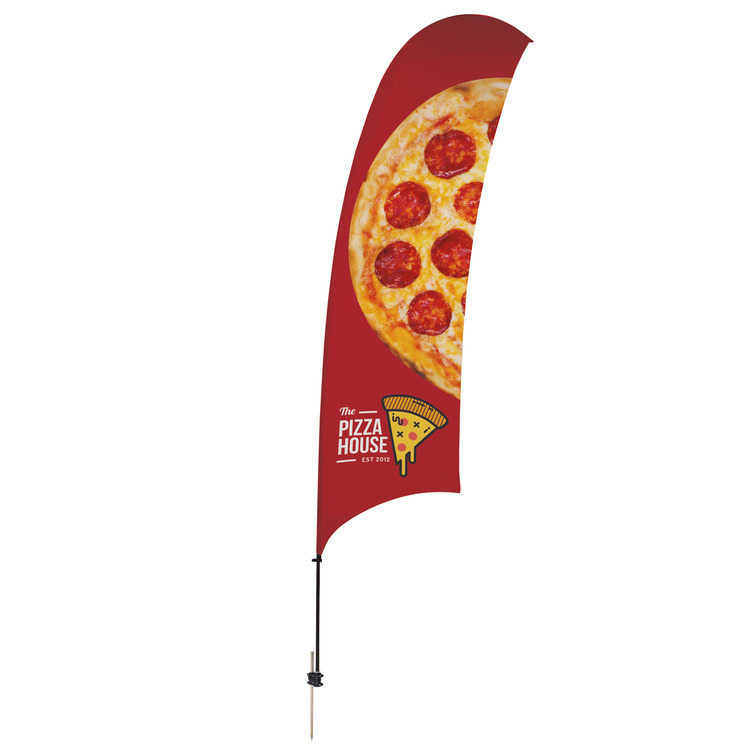 Each package comes complete with a 15’ Pole, Printed Flag and Ground Stake.